What about the shipping makes it difficult? Is buying off ebay difficult? I've heard from quite a few people that buy from ebay and have good success but they are in the states. Veneer supplies ships to Canada, Lee valley has some packages of veneer and they are already in Canada. I don't know the sizes of the doors, Is the 8 sq ft pack from lee valley not big enough? My guess you'd need 2 8 sq ft packs and at $50 each that's not cheap. Though veneer is never the inexpensive option. I think I've complained about this before, but the shipping can end up being ridiculous to Canada. I looked at veneer supplies, but the shipping was going to be over $100 (on a $120 order), and there could be duty and brokerage fees on top of that, which are unknown until it arrives at your door. Sometimes you get lucky and there's nothing else added, and sometimes it can end up costing more than the item you ordered. I generally try not to do that anymore, since I've just been burned too many times. I can order off ebay, and found some that looked good, but it was still going to be $80 in shipping according to the calculator. A lot of times something will have free shipping to the states, but if you try to get it in Canada it will be anywhere from $20 to $50. Lee valley is an option, although 8 square feet is pretty marginal for the doors. It would have to be perfectly sized, since I think the doors come out at almost exactly 8. To be safe, I'd probably need to buy three packs. I could do it, but I'd rather buy larger pieces of veneer if I'm going that route so that I don't have a big seam in my door. Each door has a panel that's around 29x19, more or less. I guess I was a bit shocked, looking around at the cost. In most cases I could buy a full sheet of plywood for less than the cost of a 2'x8' roll of veneer in pretty much anything, even pine or poplar. The idea of trying to make my own is looking more and more appealing, but I don't know how it would turn out. 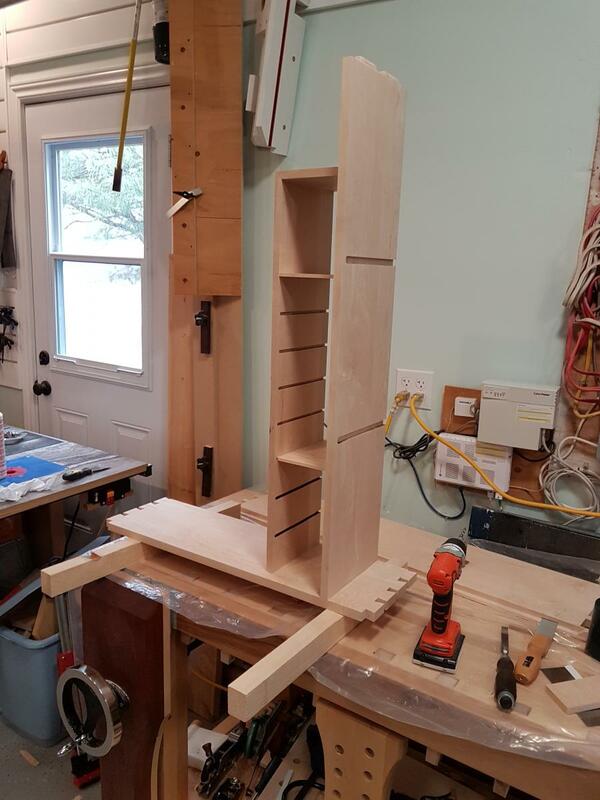 Oh believe me, I'm certainly one to go a little overboard on shop furniture as my Roubo will attest to. I'm currently debating with myself whether to even put the outer doors on my cabinet as I likely will be leaving it open most of the time, but you guys have me thinking about keeping it closed for rust protection. The other issue I'm envisioning is the size of this thing. 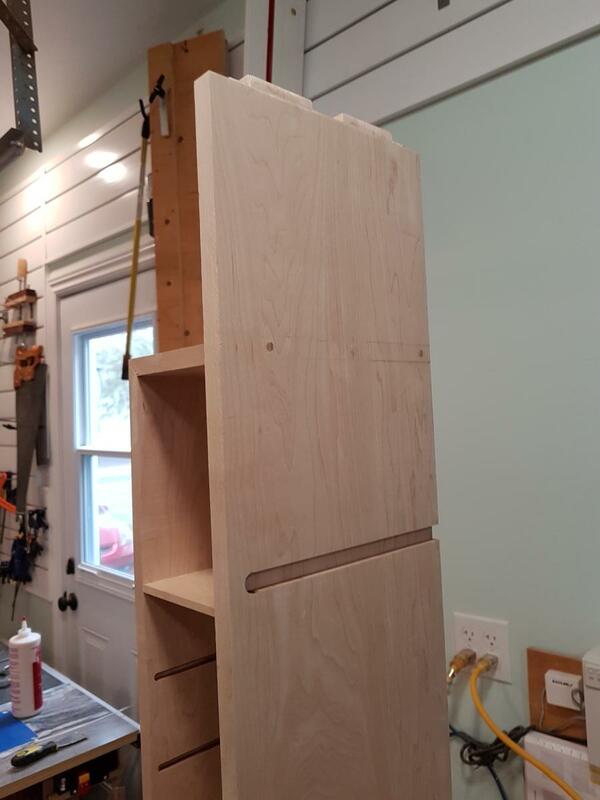 My main cabinet will be 10" deep, and the inner doors will be 3 3/4", and the outer doors are about 2", so overall I'm looking at about a 16" deep cabinet. It's just sounding a little massive, so without the outer doors, at least it's a little smaller. At least it's somewhat modular, so I can always play with it and decide from there. So I've milled all my door parts to rough size, although nothing exciting to show there. 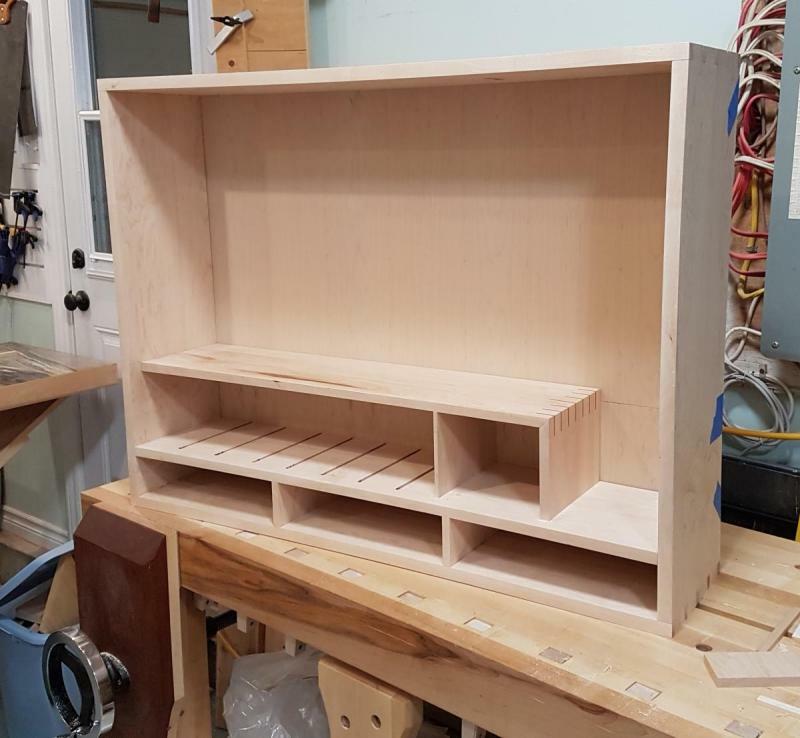 On the main cabinet, all I really need to do is add the dividers on the plane cubbies. In the plans, Matt has 7 of them with about 3 1/4" per. Looking at it, I think I can fit in 8. Anyone see an issue with the inside dimension being around 2 3/4"? I can't think of a plane that's in the 9" and under range that it would prevent. Most of what I plan to put there is block planes, shoulder plane, etc, and my smoother is 2 1/2". And just to show something, here's the Birdseye maple I got for the drawer fronts. I like that this side has plenty of heartwood in it. Why not make some spaces wider and some narrower? That's really option B. I've got 24 1/2" to work with. I can think of the following options that work, not including the divider thickness. 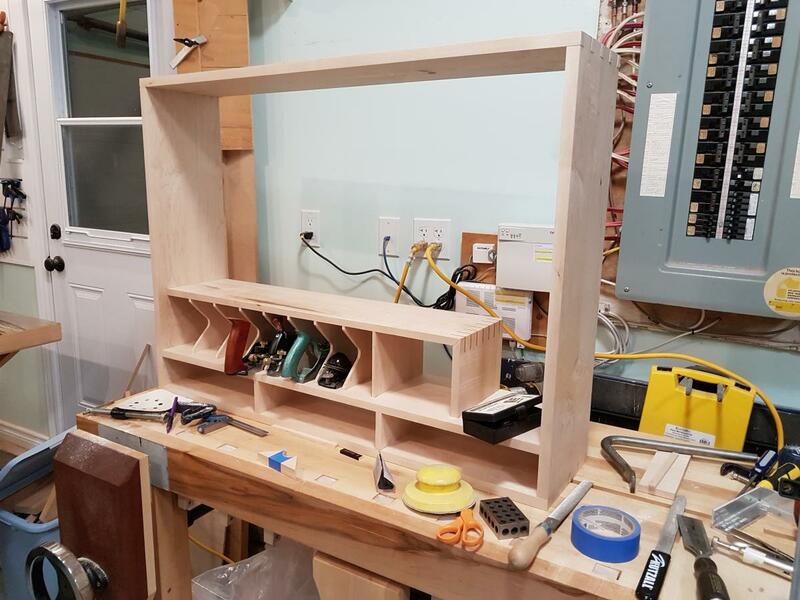 I'm also leaving 6 1/2" for the card spacer storage, rather than just barely over 6" as is in the plans, because all of my scrapers are 6" and I don't want it to be a super tight fit. 2) 8 slots that are 2 3/4"
3) 4 slots at 3 1/4" and 4 slots at 2 3/8" - this was actually my preferred option, until I realized that it meant that my most commonly used smoother would just barely not fit in the small slots. I don't want the slots to be close enough in size that I'll end up trying to jam a plane where it doesn't fit. I also started to think about whether I actually needed to make the slots different. 4) 5 slots at 3 1/8" and 3 slots at 2 1/4"
That's it for now, although I expect that I may add another smoother or joinery plane at some point. The biggest plane I could ever see trying to put here would be one of the wider smoothers that are closer to 3", but I think they might all be too long. A 10" plane would be overhanging into the next compartment by 1 1/2". Okay, as long as we're over thinking this, do the slots need dividers? If the planes will sit down nicely with each other (i.e. not fall over) then loosing the dividers gives you some more space. If the planes need lateral support to stay in place then maybe some other method such as pegs which could be re-positioned. I'm just thinking that these are the planes you have now, there could be others in your future and some of your current planes may move on to other workshops. True enough, I doubt my planes are going to jump up and bang into each other if I don't put dividers. I think it's as much of a visual division between them as anything else - it gives that look of a nice neat row of planes. I do still have lots of other places to put them in the cabinet, so this part of the storage doesn't need to be perfect. 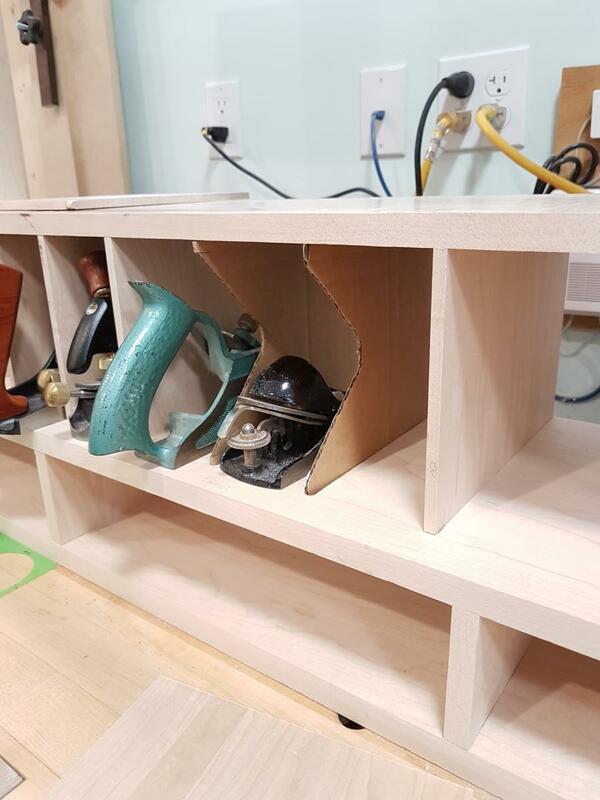 I looked at the Mike Pekovich tool cabinet and it seems he left a bit less than 2 1/2" per plane if I read the plans right. It seems like his was sized exactly to the planes he has though, which I don't want to do. As you say, you never know when a new one is going to follow you home. As you say, you never know when a new one is going to follow you home. I'd do dividers. I wouldn't really want to bang planes into each other. I know it's hard to see the future but for the planes i know will always be ther i'd size them a bit tighter and have them in a dedicated spot. For those that you will fill with strays maybe be a bit more liberal with sizing. If your really worried about it do all of this on something that is removable so in the future if you messed up you can remove it and redo it. It's a tool cabinet i think screws that get hidden by a plane or plug or something is not out of place. Or fasten it on the backside or side or something. You know, I think you're right about sizing dividers for the existing planes. Upon looking at this more, I think the way to go is three different sizes: one big enough for the shoulder/rabbet plane, the next size just big enough for the smoothers, and the largest size just over 3" since that's the biggest I might ever have. If I do that I can get 9 slots in the space without a problem, which maximizes the storage. That likely ends up being 3 slots at 1 3/4", 3 slots at 2 5/8", and 3 slots at 3 1/16". I'm going to lay it out and make sure it doesn't look strange in the case. I still have to pick a profile for the dividers, since I am going to need the finger space to get in there. I'm not a big fan of the circular period look in the plans, so I may do something a bit straighter. I finished up my cubby hole area yesterday, and I ended up with spaces about 3 1/2" wide, based mainly on the space I had available and what looked good. I figured there will be plenty of storage space available, and if I made the cubbies too small, then that in itself would be a waste of space. That's probably what I should have done - I've only gained two more spots with all this analyzing. I laid everything out tonight and started trying to route the dados. It turns out my 1/4" spiral is so dull it was setting the sawdust on fire. I'm on hold until I can go buy a new router bit . It figures too, since I actually had a couple of hours tonight to work on it. I hate it when that happens. That is working on cars for me. I get everything planned out and then find another broken part or the replacement part is missing. Then the Autoparts store doesn't have it so i have to order it and wait 4 more days. I forgot you were talking about the cabbies so i guess making it removable so you can change it down the road doesn't work. I thought you were talking about the plane till. The first part of my suggestion stands though size it to the stuff you have and leave the extra for future stuff to be more flexible. The only kicker is if you decide you want a full set of molding planes. Well, at least work is only about two minutes from Lee Valley (which is good if I need something, and bad if I just want something ). I've got a new 1/4" spiral bit in my hands for later. I was able to at least decide on the spacing, so I should be able to finish it up tonight. Unless I go out and buy a half dozen infill smoothers or something, I don't think I'll have any issues. I can't see ever bothering with molding planes or hollows/rounds - I tend not to put fancy edges on things, and I'm happy enough to use a router for it if I do. I expect this to be only half full when I'm done, with room for future expansion. I think it's much more likely that I end up buying another smoother or a low angle jack, maybe another shoulder or router plane. I need to look at the handsaw section, since I think I may add another inch or two for that instead of more planes. 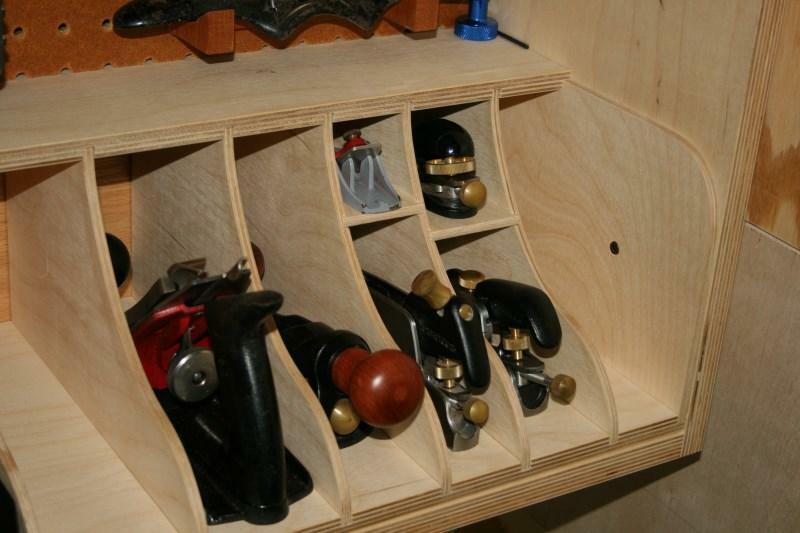 I also think I might borrow some of the Mike P. tool cabinet ideas, and put some storage for spokeshaves, etc up top. Jealous. I've never even been to a LV store. It's on my bucket list along with a lobster feed at Lie Nielsen. Megan agreed to the lobser feed. So that one should at least be easy. We've both expressed interest in seeing Niagra Falls and Canada is right there. I'd also love to make it to OPs neck of the woods. There are some many wonderful places to see in North America i don't get why people go else where before they see what we have to offer. Niagara falls is definitely worth seeing at least once. I lived there when I was young, but I'd like to make it back with my kids for a trip. Lots of choices for LV in southern Ontario, although I've heard the Toronto store is pretty unique. And where I live in Halifax is a great spot, although it's a bit removed from most other population centers. It's almost a full day to get anywhere even in Maine from here. I finally managed to route my dados, although the first couple from yesterday are a bit of a mess. Fortunately you can't really see them, so they may stay like that, with some extra glue pushed into the joint. I haven't picked my profile for the dividers yet, but I'll want to do something so they're less in the way. Here it is with a few planes to see how they fit. I think it's pretty much perfect, especially for the #6 and #7. I worked on getting everything ready for the glue up tonight. I started by mocking up the cubby hole divider using cardboard. This is what I came up with. Still has relatively straight lines, but lets me get my hand in. I also got the plywood cut for the back, and finished the rabbet for the back. At this point I've finish sanded about half the inside faces. Once I complete that, I can glue it up. 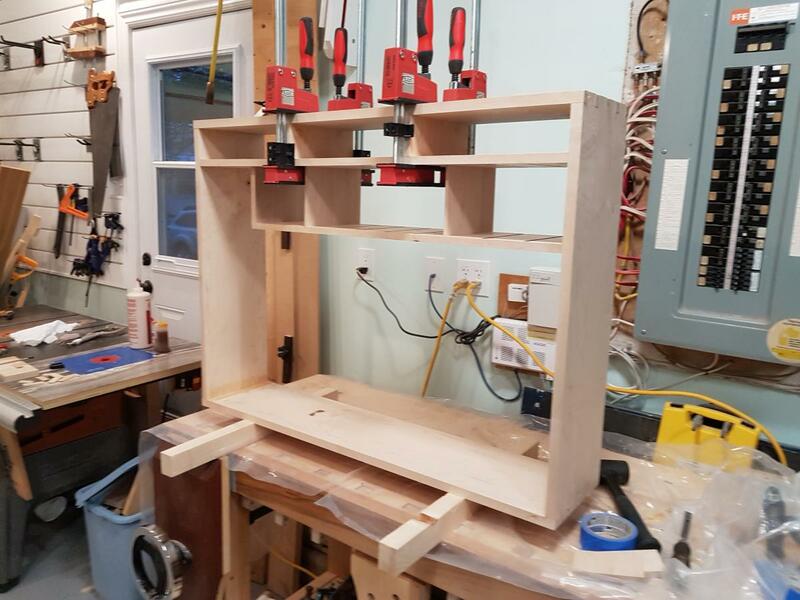 I initially tried to do my glue up on Saturday night and it was a disaster. Some of the joints were tight beforehand, and wouldn't go together once glue was on there. I was able to pull it apart and get it to the point of only partially gluing it up, to here. Next, I added a few dowels to reinforce the joint to the upper divider. This ends up taking some of the weight, so I figure it can't hurt. 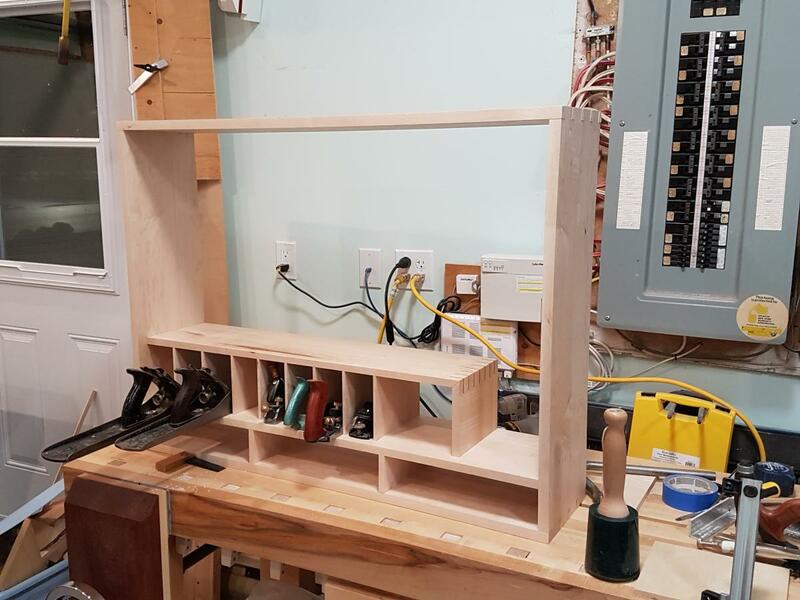 I finally glued up the main case in a couple of steps. I didn't get the dovetails to close as tightly as I'd like, but it's pretty good. I used old Brown glue to help the joints slide together, since they were all pretty tight. Part of the issue is that I only have two good clamps at that length, and I really should have bought more. I added the dividers and cleaned it up before leaving it for the night. Aside from being upside down, everything is the way it should be. I think I may install the back and hang this part while I build the test of it. I got the back trimmed and flushed up the dovetails. Looks pretty good, although I have some minor gaps to fill. The case is about 1/16 out of square over the height, which I can live with. I trimmed the back and did a test fit to see what it will look like. The maple plywood is growing on me - I might just forget about trying any veneering. That is really coming along. I would do several test removal and put-backs for planes going into the divided chutes. The profile of your divider looks like a knuckle biter to me. Looking doesn't tell the tale like actual use. It may be a matter of depth; if it works, it works . Just an observation. I appreciate the feedback. I did try out my cardboard version several times before I cut all of them to the same profile, and they seemed to work well. I definitely couldn't have left them vertical. I tried a semi circle version as well, and didn't find it helped a lot for clearance, and I just didn't like the look as much. I've already cut the slots in the top and bottom divider pieces, so I couldn't step them back any further. The one downside to the profile is that I probably couldn't stack two planes as in your picture, but I don't have enough that I need to.